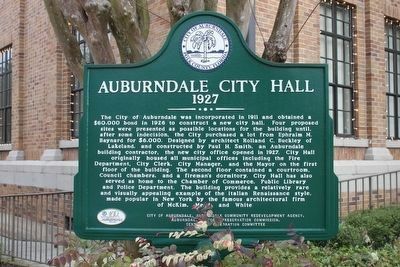 The City of Auburndale was incorporated in 1911 and obtained a $60,000 bond in 1926 to construct a new city hall. Four proposed sites were presented as possible locations for the building until, after some indecisions, the City purchased a lot from Ephraim M. Baynard for $6,000. 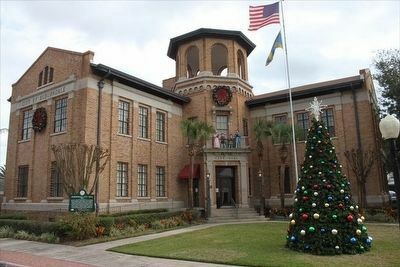 Designed by architect Rolland C. Buckley of Lakeland, and constructed by Paul H. Smith, an Auburndale building contractor, the new city office opened in 1927. City Hall originally housed all municipal offices including the Fire Department, City Clerk, City Manager, and Mayor on the first floor of the building. The second floor contained a courtroom, Council chambers, and a fireman's dormitory. City Hall has also served as home to the Chamber of Commerce, Public Library and Police Department, The building provides a relatively rare and visually appealing example of the Italian Renaissance style, made popular in New York by the famous architectural firm of McKim, Mead and White. Location. 28° 3.884′ N, 81° 47.355′ W. Marker is in Auburndale, Florida, in Polk County. Marker is at the intersection of East Park Street and Bobby Green Plaza, on the right when traveling east on East Park Street. Touch for map. Marker is at or near this postal address: 1 Bobby Green Plaza, Auburndale FL 33823, United States of America. Touch for directions. Other nearby markers. At least 8 other markers are within 4 miles of this marker, measured as the crow flies. "Flatiron" Triangle Building (within shouting distance of this marker); Patterson Retail Building (about 400 feet away, measured in a direct line); Seaboard Air Line Rail Depot (about 600 feet away); Bayard Retail Building (about 600 feet away); Ephraim M. Baynard House (approx. 0.2 miles away); a different marker also named Ephraim M. Baynard House (approx. ¼ mile away); City's First Fire Engine (approx. 0.3 miles away); Fort Cummings (approx. 4 miles away). Touch for a list and map of all markers in Auburndale. More. Search the internet for Auburndale City Hall. Credits. This page was last revised on June 16, 2016. This page originally submitted on March 20, 2016, by Tim Fillmon of Webster, Florida. This page has been viewed 224 times since then and 3 times this year. Photos: 1, 2. submitted on March 20, 2016, by Tim Fillmon of Webster, Florida. • Bernard Fisher was the editor who published this page.